Love serving chili with cornbread? 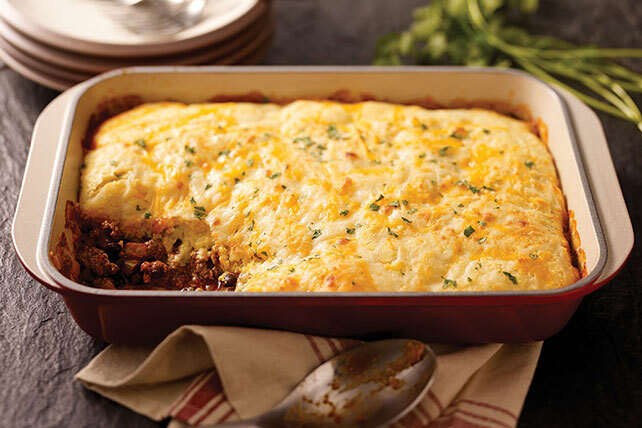 This beefy, cheesy Cornbread Casserole with Cheese delivers on your favorite flavor combination, with super easy prep. Brown meat with onions and peppers in large skillet. Stir in next 4 ingredients; cook and stir 3 min. or until heated through. Spoon into 13x9-inch baking dish sprayed with cooking spray. Prepare muffin batter as directed on package; stir in cheese. Spread over meat mixture. Bake 20 min. or until toothpick inserted in center of cornbread topping comes out clean. Serve with your favorite steamed vegetable to round out the meal. Prepare meat mixture. Refrigerate 3 to 4 days, or freeze up to 1 month. When ready to use, spoon into baking dish. (Thaw first, if frozen.) Top with muffin batter and continue as directed. Bump up the flavor by stirring chopped canned chipotle peppers in adobo sauce, or chopped fresh chives, into muffin batter before using as directed.